By now you probably know the story of Colombian drug lord Pablo Escobar's hippos, which are now wreaking havoc in Colombian wetlands. If you don't, here's a quick recap. While Escobar was in power, he worked on creating his own personal zoo on his property, Hacienda Napoles. He imported everything from rhinos and giraffes to exotic birds, and of course the hippos. Nobody really knows how many hippos he had, but suffice it to say that there was at least one male and one female. After Escobar's death in 1993, the government seized the estate. Some of the animals died, others were relocated to proper zoos, but the hippos stayed behind. And there they did what hippos do best. As Earth Touch editor Kelly Starzak explains, after a while the hippos expanded their range beyond the estate (now a theme park) and began to cause trouble for neighboring farmers and fishers. One even crushed a cow. There are now some 50 to 60 individuals, according to recent estimates. But, as Starzak explains, the animal welfare-minded public won't allow the hippos to simply be culled. 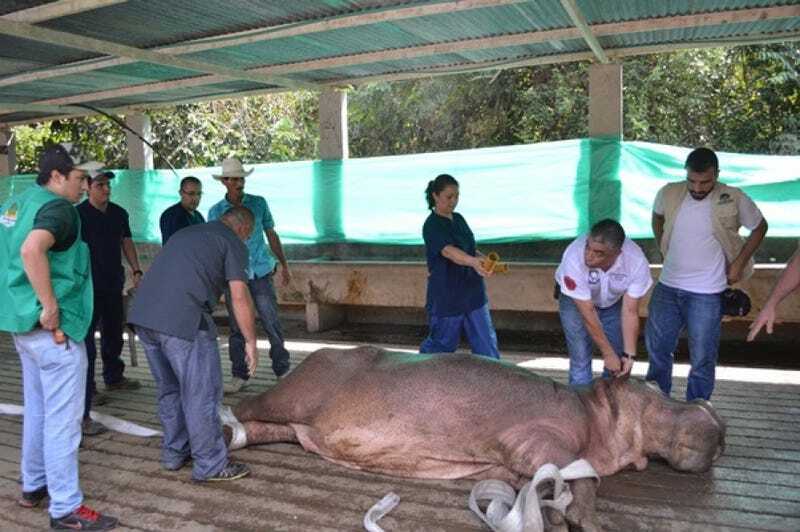 Efforts to find a workable solution to the hippo problem have also been snarled by public sentiment – when a hippo escapee dubbed Pepe was shot by authorities in 2009 for posing a danger to the public, the move sparked an unexpected backlash. Starzak reports that the surgeries went well, though they lasted three hours each. The two hippos, nicknamed Joaco and Matildo are recovering nicely. Oh, and the source of funding for these expensive operations? Money seized from drug traffickers. Which seems appropriate. Header image via Cornare, a regional environmental group.